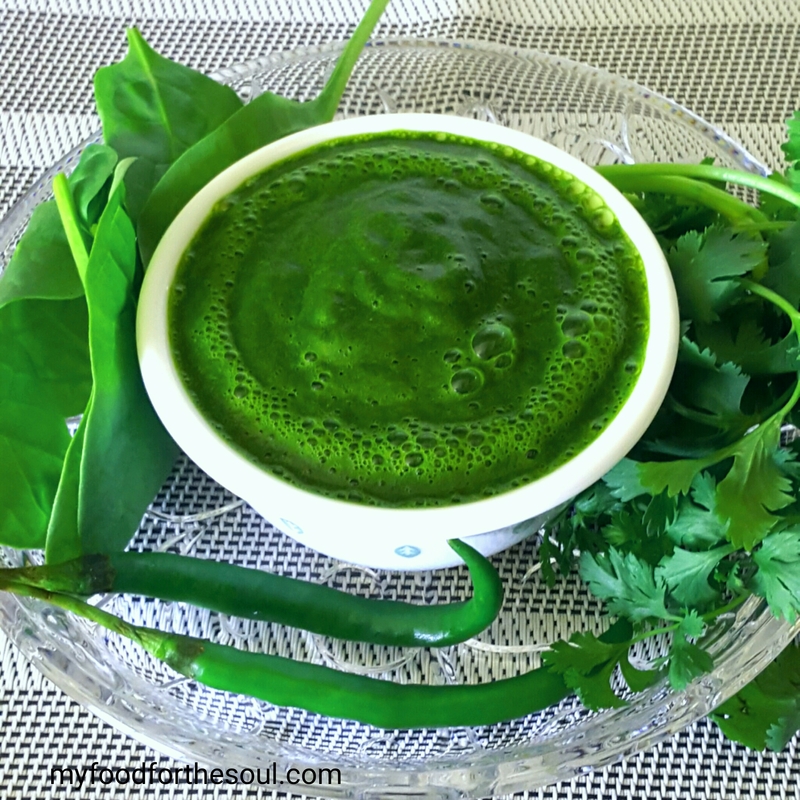 This very popular Mumbai Style Green Chutney adds a very special zing to any recipe, but it especially goes well with sandwiches which are commonly found on the roadsides of Mumbai. Many street-side vendors in Mumbai prepare this special chutney on a daily base to serve up with Sandwiches, Khaman Dhokla, White Khatta Dhokla, Chaat, Ragda Patties and many more favorite dishes. This chutney goes very well with many snacks as an excellent condiment. The best part of this absolutely tasty delicious chutney is that it’s super quick and easy to make. Chutney is a very common condiment that is made in my house on a regular base. Chutney is so versatile and can be made in many different flavors and textures. 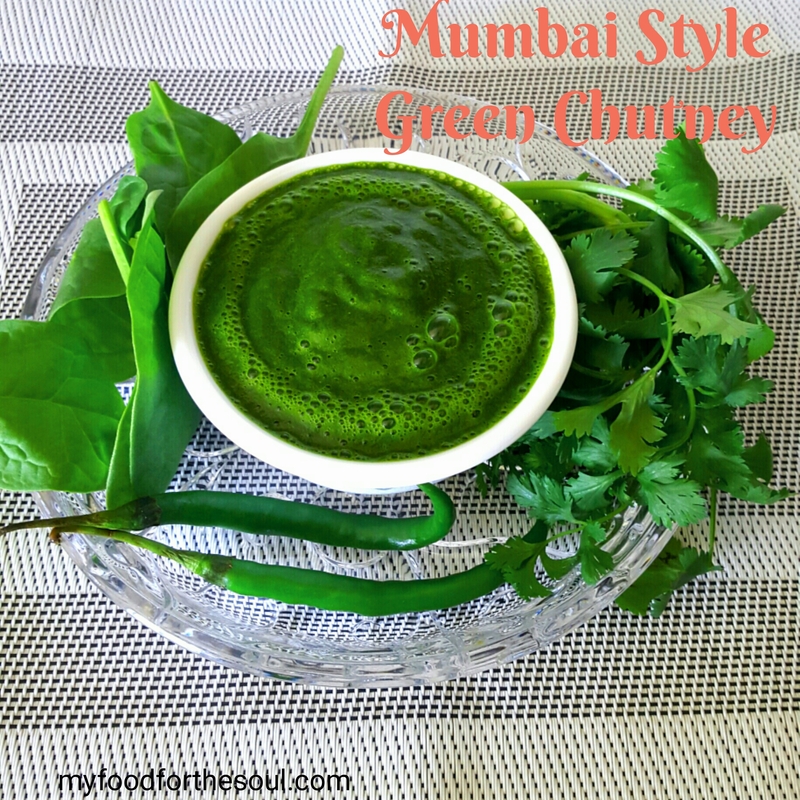 I’ve posted previously some other famous Green Chutneys like Green Coriander Chutney and Mint Coriander Chutney that are also very delicious and easy to make. 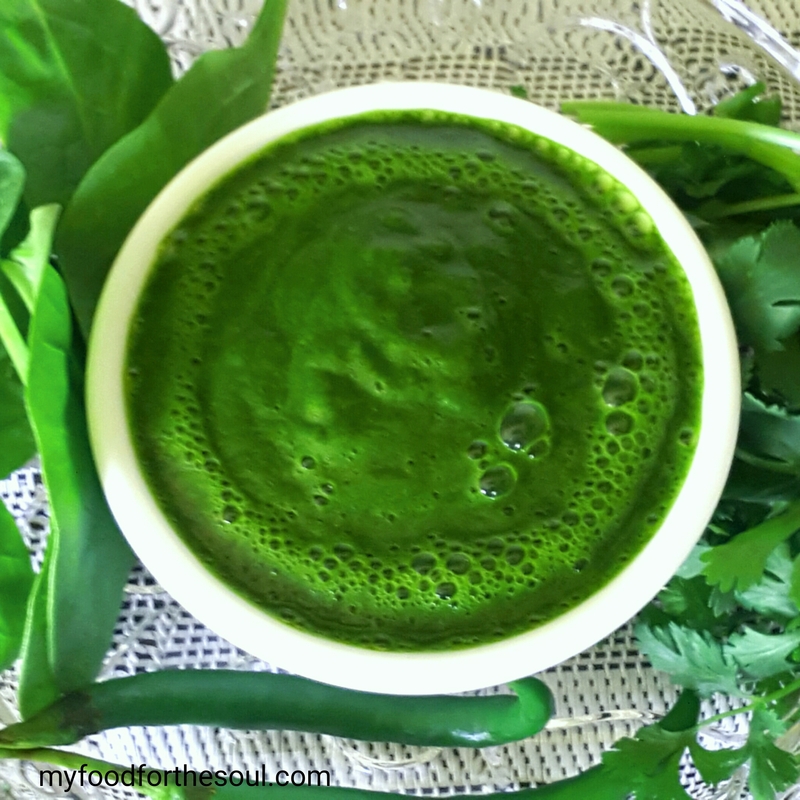 The basic four ingredients of this chutney “Coriander (Dhania)”, “Spinach (Palak)”, “Green Garlic” ( hara lehsun) and Green Chili (Hari Mirchi) is what gives it that gorgeous vibrant green color. Many of the greens here that I’ve use in this chutney are straight from my garden. Green Garlic is one of the most easiest herbs to grow in any garden, Once planted into the garden or in a planter …they keep growing year after as long as you take care of the herb. I like to use Green Garlic in many of my dishes ….whether it’s Indian or Western I like to add this green herb to enhance the flavor cause it has a very mild flavor and the aroma is Devine from the green garlic. Green Garlic is seasonal so when in season I like to use it as much as possible and also freeze some for non-seasonal times. Did you know that Green Garlic also multiplies the health benefits of garlic? It’s healthy and low-calorie it helps boost the immune system, source of Antibiotic, Rich in Iron, Good for the Heart. Many more helpful tips on Green Garlic can be found here “Amazing Health Benefits of Green Garlic”. Mumbai Style Green Chutney is also perfect for marinating paneer and grilling it for wraps or sandwiches. Impress your guest with this super easy and quick chutney and serve it up as a dip or spread with favorites like Pakora, Samosa, Methi Kela Na Bhajiya, Mini Cucumber Sandwiches, Vada Pav or Chaat. Other delicious recipes that this Mumbai Style Green Chutney goes well with are: Carrot Zucchini Paratha, Broccoli Tofu Paratha, Methi Palak Thepla, Aloo Palak Paratha with Cheese and Spinach Tomato Omelette (Eggless). Combine all of the above ingredients along with 1 tbsp. of water and blend in a mixer to a smooth paste. Serve it up with your favorite dish. adjust water accordingly. Chutney should not be to liquidy. Thank you so much The Yummy Lounge!